It is made of ultra-soft fabric that's gentle on skin and provides comfortable-fit. It has adjustable straps with soft nose pad. Face-fit made basis 3D scanning technique for the Asian face. At Dettol SiTi SHIELD we believe you shouldn’t have to choose between your lifestyle and pollution protection. We believe that every breath you breathe should be pure. We've developed an extensive anti-pollution system using cutting edge science from around the world. The result? Outstanding pollution protection fit for your lifestyle. Dettol SiTi SHIELD N95 Protect+ Anti-Pollution Smart Mask provides 98% 3-layer filtration of PM2.5 pollution particles*. It has European certification CE0194 EN149 FFP1/FFP2. 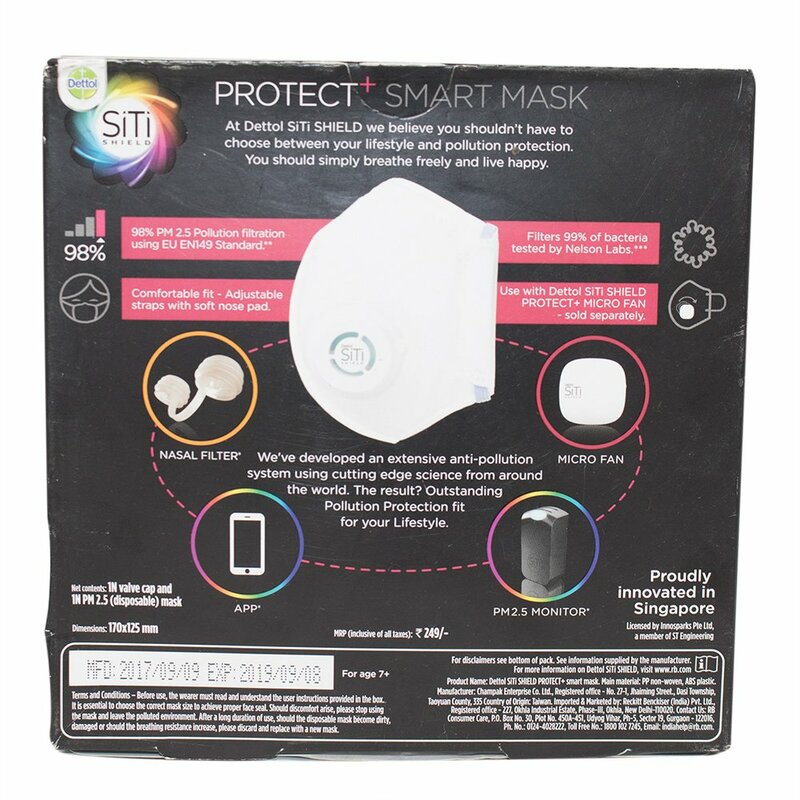 Innovated in Singapore, the Dettol SiTi SHIELD Smart Mask is engineered in 3 sizes (S size, M size, L size) to create superb fit for a broad age range, even for young ones. This anti-pollution mask provides 99% filtration of bacteria, as tested by Nelson Laboratories**. Smart valve fitted on the inside of the mask provides seamless outflow of exhaled air providing better comfort. It is made of ultra-soft fabric that’s gentle on skin and provides comfortable-fit. It has adjustable straps with soft nose pad. Tested in the US, the mask is made basis Face-fit 3D scanning technique for the Asian face. From the makers of Dettol, the smart anti-pollution mask is fit for the entire family. It is designed and tested to fit Children (7+). Stay Fresh with Dettol SiTi SHIELD Protect+ Micro-fan for improved breathability and increased cooling. Airflow is key to provide circulation assistance within the mask. From the makers of Dettol, the powered micro fan effectively extracts heat, moisture and accumulated CO2 out of the mask. It is for use with Dettol SiTi SHIELD Protect+ N95 Anti-Pollution Smart Mask. Rotate and remove the valve on the mask and fit it with the micro-fan unit. It removes heat, moisture and carbon dioxide (CO2). 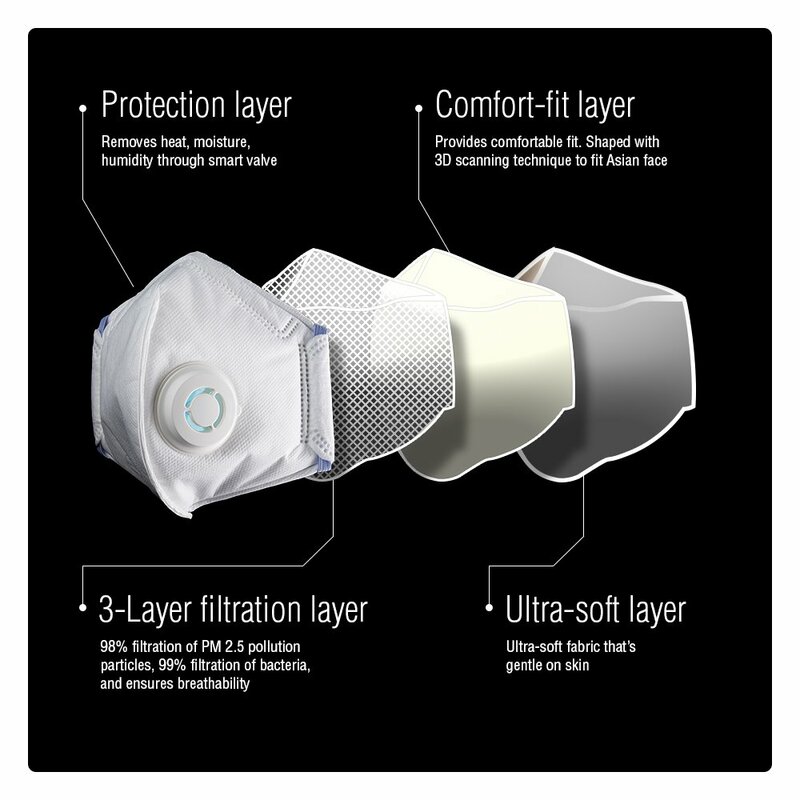 Innovated in Singapore, in combination with Dettol SiTi, Dettol SiTi SHIELD Protect+ N95 Anti-Pollution Smart Mask gives you 98% 3-layer filtration of PM2.5 pollution particles. The Micro Fan can be charged up to 300 times. It is CE certified and FCC certified. The micro-fan should be used with the Dettol SiTi SHIELD Protect+ N95 Anti-Pollution Smart Mask. *Tested by INSPEC following EU EN149 standard, proven to filter at least 98% of non-oil particles. **Tested following ASTM F2101 (standard proven to filter >99% of bacteria).